On the heels of 2010, it’s time to reinvent your professional self. Whatever your penchant, try something new this coming year—like hosting a webinar or learning to love tai chi. The new year is just around the corner, and it is the perfect opportunity to discover ways you can grow your business and enhance your knowledge. 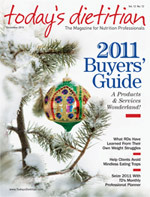 Just as we helped prepare you for 2010, we’ve rounded up RDs’ top suggestions for expanding your professional horizons in 2011. Some of these ideas may require you to step outside your comfort zone, but each has the potential to positively impact your business. So unwrap your 2011 calendar and pen in this to-do list. You’ve likely read some of our articles about getting accustomed to the Web for the benefit of your business, but many professionals are still taking the old-school route and marketing in the Yellow Pages or banking on word-of-mouth referrals. This new year, grab the bull by the horns and get your site in gear. It will pay off. Constance Brown-Riggs, MSEd, RD, CDE, CDN, a spokesperson for the American Dietetic Association (ADA) and author of The African American Guide to Living Well With Diabetes, says joining the conversation with other RDs and patients means getting involved with social media. Many dietitians aren’t using social media in their business and marketing plans. Maybe you have a Facebook page or even a blog for fun, but if you’re not using it for business, you’re missing out on a great opportunity. Brown-Riggs recommends social media newbies take a course such as “Blogging for Passion and Profit” with Jane Boursaw. She says it will allow RDs to “dip their toes in and see how it feels. Visit www.blogging-for-passion-and-profit.com for more information. Spring has sprung and that means flowers are blooming and various outdoor organized runs—for charity or fun—are cropping up. Running or walking in a 5K is a great way to set a good example for your clientele. Reisinger says those who have never run a 5K should follow what she calls a “Couch to 5K” program to get started. Begin with smaller runs and build up to the 3.1 miles that encompass this race. More advanced runners should map out a 5K route to determine their capabilities, she suggests. She recommends using www.mapmyrun.com. Being a mom doesn’t mean you can’t also be a professional, and vice versa. In honor of Mother’s Day, this month’s suggestion is geared toward RD moms. Sarah Krieger, MPH, RD, LDN, consultant and instructor for Fit4AllKids and mother of three young children, says she wants other RD moms to realize they can find a way to do it all—if doing it all is what they want. Doing tai chi, the ancient Chinese form of movement meditation that combines breathing and relaxation techniques with slow, deliberate movements, is a great way to relax after a busy day with clients. It’s also an activity you might consider recommending to your clients. A University of Florida study found that a regular tai chi exercise program may help lower blood glucose levels, allowing people with diabetes to better control the disease. But before recommending it to a patient, try it for yourself. Like it or not, many people get their nutrition advice from a vitamin or local health food store employee when they buy their supplements. Molly Kimball, RD, CSSD, a nutrition writer, speaker, and consultant, believes it would behoove RDs to spend some time—whether it be a day or a few hours—with a local health food store clerk. Kimball says meeting with your local health food store or supplement supplier is also a great way to establish a relationship that could lead to referrals, and it can alert RDs as to which supplement side effects need to be on their radar. Palinski says hosting a webinar that anyone can attend, no matter where they live, can stretch your influence and marketing beyond your brick-and-mortar office space. “You can reach family and friends of current patients and build social media followers who will visit your blog, all of which will help expand your business online. I have also found [webinars] to be a terrific marketing tool for getting past patients back in the door,” she notes. Recognizing that September is National Childhood Obesity Awareness Month—and back-to-school time for most kids—consider doing your part to encourage your local school district to opt for more healthful meals. Barbara Baron, MS, RD, CDN, spokesperson for the National Dairy Council, says it’s important not to overlook the fact that while the childhood obesity epidemic is growing, many children and adolescents are undernourished and not getting the recommended amount of key vitamins and minerals they need for growth. The National Dairy Council recently partnered with the National Football League to launch Fuel Up to Play 60, a program that empowers youths to take action to improve nutrition and physical activity at their school. Villacorta wants all of that to change and hopes others will follow his dream of embracing chopping, slicing, cooking, smelling, tasting, and savoring foods. He says his own cooking has helped his practice by giving him great ideas to suggest to clients. Kimball also says reading what your clients read will help you better connect with them. “Sometimes we get so bogged down with more clinical thinking that we lose sight of some of the things our clients are interested in and want to learn more about,” she says. Ginn also notes that giving back to students is quite rewarding. “I love seeing the excitement on young students’ faces when you can help them put the puzzle of their dreams together,” she says.